There are three main categories of features that work together to make a basement reliably dry: an impervious foundation wall; vertical drainage channels that allow water to move downwards on the outside of foundation walls while preventing soil from creating hydraulic pressure; and horizontal drainage pathways that allow water to flow away from the lower parts of a basement and footings. 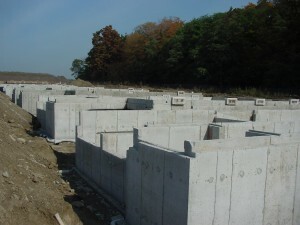 There are three main categories of features that work together to make a basement reliably dry: an impervious foundation wall; vertical drainage channels that allow water to move downwards on the outside of foundation walls while preventing soil from creating hydraulic pressure; and horizontal drainage pathways that allow water to flow away from the lower parts of a basement and footings. There are plenty of dry basements in Canada that don’t have all or even any of these features in place, but why tempt fate? You never really know for sure how a basement will behave just by looking at the site, and that’s why it pays to get all the waterproofing protection you can working on your side early on, creating multiple layers of safety, while diligence is still easy to make happen. Vertical drainage membranes offer the single most effective improvement in basement moisture control over the last 20 years, which is especially surprising since they look so ineffective. These dimpled plastic sheets fasten to the outside of masonry foundation walls, leading from soil level at the top, down to weeping tiles at the footing. Seams simply overlap, with the membrane held against the wall with fasteners until backfilled soil does the job permanently. Even though unsealed seams on vertical drainage membranes prevent the installation from being completely waterproof in and of itself, these products go a long way to keeping out basement water by greatly reducing soil pressure against the foundation wall. Without soil pressure, water is free to trickle downwards by gravity unimpeded, with no reason to travel horizontally through the foundation wall and into the basement. If project plans call for a poured foundation wall, then you’ve got a powerful option for keeping basements dry. That’s where a product called Cementaid can help It was developed more than 50 years ago and remains relatively unknown, even after proving that it can make concrete absolutely and completely waterproof. Where conventional concrete mixes are highly porous after they cure, Cementaid makes concrete so structurally waterproof that it’s even been used to make successful roofs. Depending on where you build in Canada, bedrock is something you may never have seen on your jobs, or something you see all the time. And whenever bedrock exists anywhere near a basement, it poses two challenges when it comes to creating reliably dry basements. First, if bedrock is at basement floor level or several feet below, it always prevents downward movement of rain and meltwater, typically forcing water to flow horizontally as it follows whatever slope the bedrock’s got. I know because I’ve seen this in several situations, and no amount of weeping tile, drainage membrane or waterproof coatings are going to keep bedrock-blocked water from moving into a basement. The only effective way around the problem is to create a concrete floor on top of a 6” to 12” layer of coarse and clean crushed stone laced with drainage tile. Draining this underfloor cavity (either with drainage tiles or a sump pump) acknowledges that the water will come in, but keeps it hidden and deals with it out of sight. Wherever bedrock is present in a basement, there’s another problem, too. The surface of bedrock is usually cold enough during summer to trigger large and damaging amounts of condensation if warm, humid air is allowed to touch the surface. The rock cools down the air to below the dew point, causing liquid water condensation to develop. Fiber-based insulations can’t prevent this because moisture-laden air simply moves right through it. The only option for preventing bedrock from sweating condensation is by sealing it behind impervious, closed-cell insulation, either spray or sheets.